“Forgotten lines of ancient magic and the power of the throne. One will make them both his own if his heart sees the true power. He will bring light to fight darkness and love to fight hate if he reaches into the power of his heart...” So continues the ancient Cremelino Prophecy. In the second book of this young adult/teen fantasy series, Darius San Williams, now the first commander of the King’s Elite Army struggles with his emerging and ancient powers. After winning his first battle against external foes, he must decide now to follow the King or to take matters in his own hands. Back in Anikari Christine wrestles with how to confront oppression against her people, while in Belor, Kelln must escape the clutches of an evil wizard and warn Darius. Mezar, the captured Gildanian quietly watches everything closely and harbors a secret of his own. Each of their decisions will determine the fate and destiny of their friendship and their kingdom. The first book in the Cremelino Prophecy series, The Path of Destiny, is a story of seeking your identity, The Path of Decisions is a story of finding your identity. In the first book, Mike Shelton gives us a long character development story with little adventure. 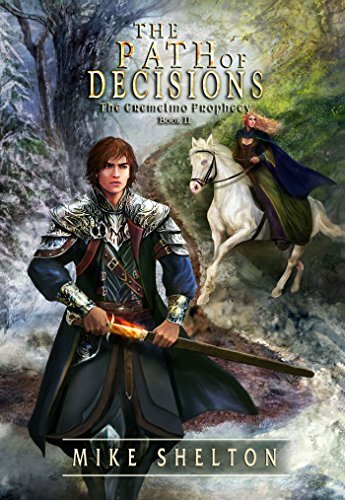 Fortunately, The Path of Decisions sees the characters solidifying their identities and it moves us into the adventures, intrigues, magic, and good versus evil found in a solid fantasy, adventure, sword and sorcery fiction novel. The Path of Decisions is a clean story; there is no bad language and no sexual content. Shelton encourages virtues such as bravery, integrity, honesty, loyalty, willingness to admit and seek restitution when you are wrong, and so on. I’m going to let the quotes speak for themselves but the main component of the religion and philosophy Shelton writes is that of love and doing the right thing. God is loving but that is far from His most defining characteristic. We cannot begin to understand what is right in God's eyes before we have been redeemed or saved because of Christ's sacrifice. The Bible tells us that an unbeliever cannot please God. We are wretched sinful creatures that a mighty and wrathful God has chosen to show mercy upon. This mercy is where the love of God is shown. It is through the gift of the Holy Spirit, time spent studying the word of God, fellowship with other believers, and a sincere willingness to be a disciple that the “Someone” Shelton introduces us to in the second quote above, someone that I call God, “directs us toward good”. As long as your teen is spiritually discerning this is a book that I believe they would enjoy. I did. I was born in California and have lived in multiple states from the west coast to the east coast. I really cannot remember a time when I wasn’t reading a book. At school, home, on vacation, at work at lunch time, and yes even a few pages in the car (at times when I just couldn’t put that great book down). Though I have read all sorts of genres I have always been drawn to fantasy. It is my way of escaping to a simpler time filled with magic, wonders and heroics of young men and women. Other than reading, I has always enjoyed the outdoors. From the beaches in Southern California to the warm waters of North Carolina; from the waterfalls in the Northwest to the Rocky Mountains in Utah; I have appreciated the beauty that God provides for us. I also enjoy hiking, discovering nature, playing a little basketball or volleyball, and most recently disc golf. I have a beautiful wife who has always supported me and three beautiful children who have been the center of my life. I began writing stories in elementary school and moved on to larger novels in my early adult years. I have worked in corporate finance most of my career. That, along with spending time with my wonderful family and obligations at church have made it difficult to find the time to truly dedicate to writing. In the last few years as my children have become older I have returned to doing what I truly enjoy – writing! I love to hear from my readers about their favorite characters and what they liked/didn't like about my books!